Prolonged sitting has become a habit for many of us. There are many different reasons to give into this habit: long hours in front of our computer, watching television for hours on end and driving our car for prolonged periods, to name a few. Sitting is being viewed as the ‘new smoking’. This refers to the adverse health effects caused by prolonged sitting such as an increased risk of heart disease, back pain and diabetes. The lack of movement associated with sitting actually shortens our muscles and connective tissues. Our tendons and ligaments change significantly and we become stiffer, less flexible and weaker. Our muscles play an important part in our metabolism. As healthy muscle fibres get replaced by fatty tissue, our metabolism slows. Hence the increased risk of diabetes and heart disease. 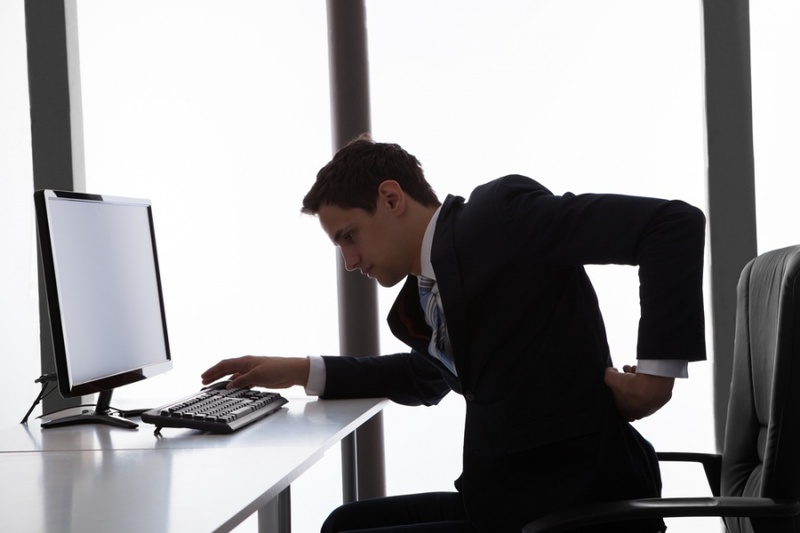 Prolonged sitting is a serious health issue which needs to be addressed. As chiropractors and occupational therapists, we are particularly interested in the effects sitting has on hip and back pain. What happens if I’m sitting too much? Over time, the change in your muscles and tendons is what creates feelings of tightness. And if you don’t change the habit, you will probably notice that the tightness develops into pain. It can be felt as pain in your lower back or hips. If left untreated, your walking pattern will adapt to this discomfort. This will shift your balance, change your posture and lead to excessive use of other joints, muscles and tendons. It is a negative chain reaction that leads to a loss of energy and a spread of pain to other areas of your body. This is why we say it is important to pay attention to proper sitting posture and the need to get up and move around regularly. We call this ‘active sitting’. Don’t wait until you start noticing hip or back pain and stiffness – or the feeling that it takes you longer to stand up or reach a normal stride when walking. Get your back, hips and lower extremities assessed before you feel your knees and hips have worn out. We will show you a set of simple and effective exercises that will increase the strength and flexibility of your back and hip muscles. We pay particular attention to your hip joints with the aim of avoiding premature wear and tear which can seriously affect your ability to get around and enjoy life. In the video I’ll show you a few stretches to ease the tension across your hip joint. It’s important to keep your pelvis straight, so you create a nice stretch along your leg. As shown in the video, you can lift up your foot to increase the level of the stretch even more. If, at any time while you do this exercise, you feel that it becomes painful, contact your chiropractor at Burswood Health so we can check out your hip joint and assist you with customised exercises. Why visit Burswood Health Podiatry? Burswood Health is a multi-disciplinary clinic with a team of experienced and friendly practitioners. Our chiropractors focus on your spinal health, your joints, muscles, ligaments and nerves. Our Occupational Therapists can help you improve your balance, coordination skills so you can live your best possible life. And our Podiatrists can assist with the health and function of your feet. So if you feel any discomfort and you’re aware that you’re sitting too much, come and speak to us so we can help you with any hip problems.